Avid art collectors, world travelers and prominent St. Louis civic leaders, the owners of this unique residence in Clayton demonstrate that ingenuity, skillful design and a team of talented professionals can meet virtually any challenge – in this case, a multitude of challenges! Eventually, they found a 1950s-vintage home with a manageably sized yard in a quiet residential neighborhood, but the house itself would need major renovation. Based on a referral from a friend and business associate, the couple turned to Garison Salinas, architectural design consultant and principal of Garrison Ltd.
Salinas admits to a certain amount of trepidation when undertaking the project, which took nearly 18 months to complete. “The owners were accustomed to working with international designers,” he explains, “and they knew exactly what they wanted. It had to be their ‘forever’ home – functional, minimalist, with the primary living spaces all on one level. Most importantly, it had to be designed around their extraordinary collection of contemporary art.” Equally challenging, all modifications to the property would be subject to Clayton’s rigorous architectural guidelines. An early hurdle was the couple’s need for a two-car attached garage. The small lot made this problematic, since the city stipulates an acceptable ratio of permeable to impermeable ground surface. The solution was to put the garage underground, beneath the patio and a portion of the backyard and accessible from the home’s lower level, with elevator service to the upper floors. Although somewhat “revolutionary” to city authorities, the concept was ultimately approved, and construction began under the supervision of Brian Fuchs, Fuchs Construction. Now in residence, the owners enjoy an environment that can only be described as a superb fusion of fine art and meticulous interior design. 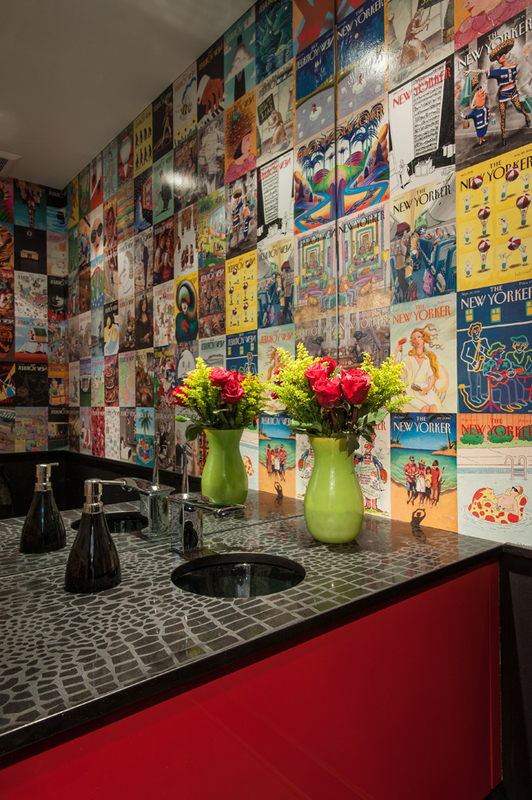 The dramatic décor is immediately evident. A large feng shui symbol is carved into the entry door, and the porch’s Valders Stone flooring extends into the foyer. 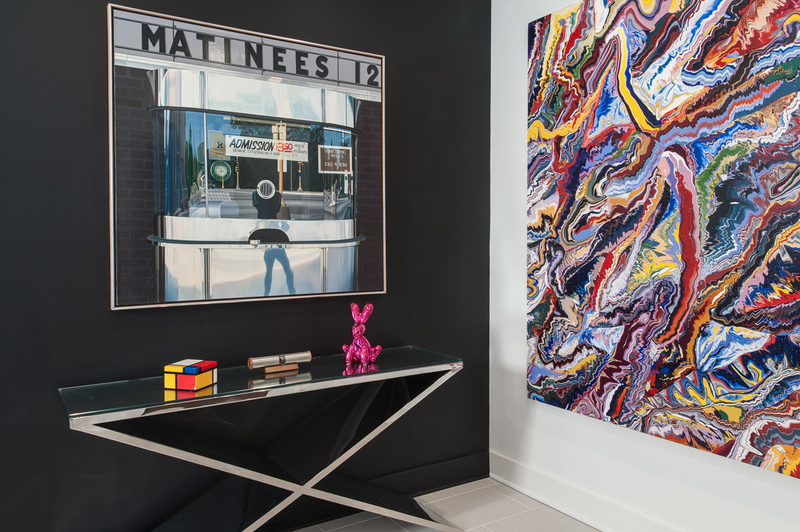 Directly ahead, a hyper-realistic street scene by St. Louis artist Robert Forbes is set against a stark black wall and flanked by a vivid Frank Owen abstract. Drawing the eye into the great room are a wall sculpture by Lori Cozen-Geller and Claes Oldenburg’s lithograph, Scissors as Monument. Completely open, the main level’s activity areas are filled with vibrant color and natural light. High-engineered, espresso-hued Mirage hardwood flooring and white walls establish a sophisticated “gallery” effect, emphasizing rather than competing with the stunning artwork. 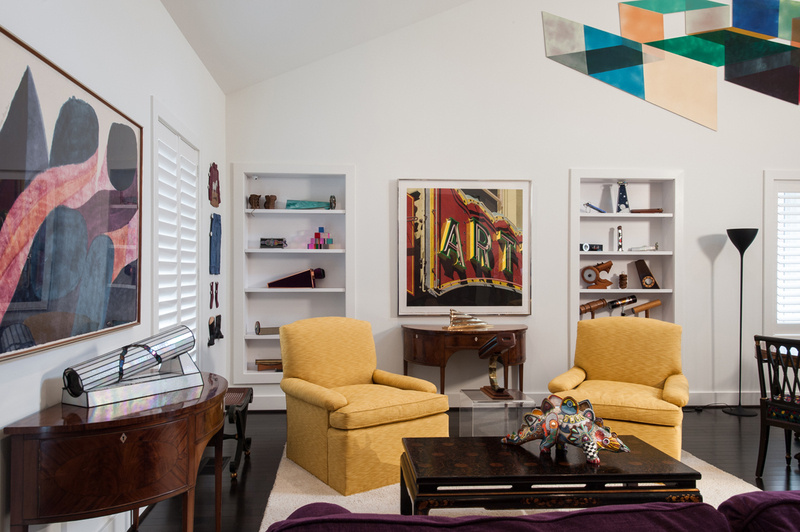 In the great room, for example, a custom-made Tom Britt sofa and cadmium-yellow club chairs are combined with several oriental tables and two antique demilune console tables, one topped by Ernest Trova’s Flowing Man. Displayed in the 21-foot vault are Square Wave, a trompe-l’oeil by Ron Davis, and on the opposing wall, another geometric Cozen-Geller sculpture in brilliant yellow. 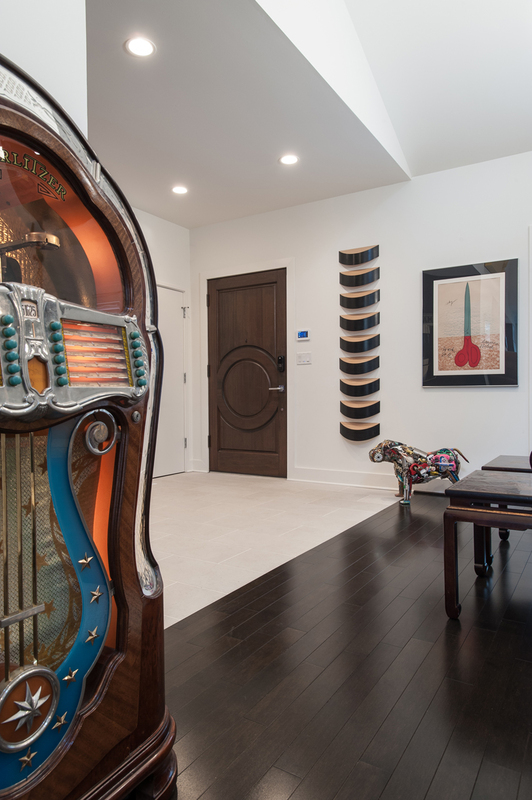 Below, a quintessential Frank Stella abstract is whimsically hung above a 1947 Wurlitzer jukebox. 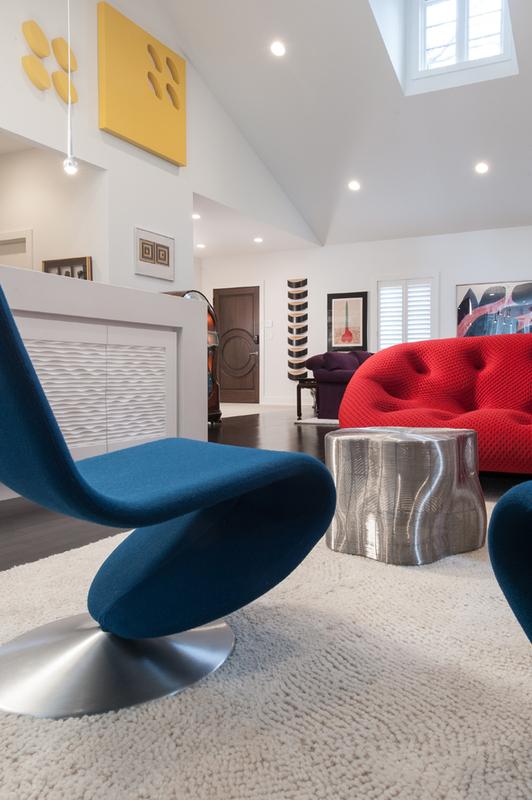 The formal dining area contrasts a handsome Regency dining table and chairs with the adjoining hearth room’s vivid red Ligne Roset lounge, gravity-defying side chairs in marine blue and sculptural steel mesh occasional tables. 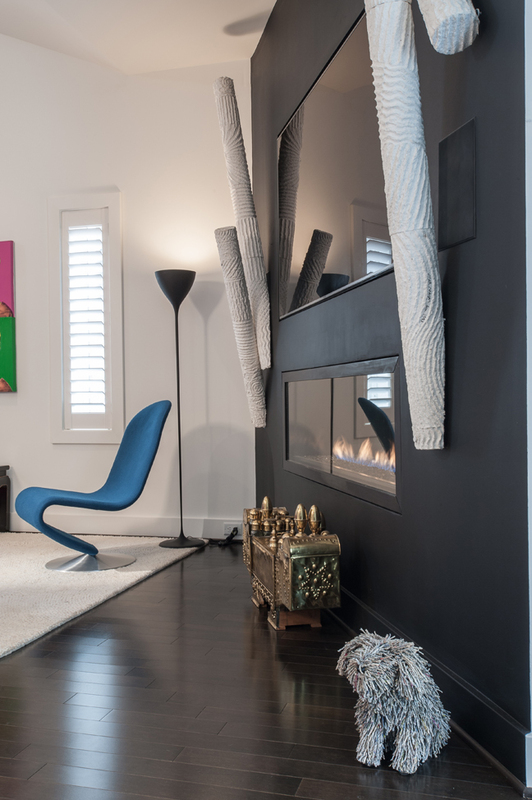 Cylindrical white sculptures by Brother Mel bracket the inset fireplace and flat screen TV, made nearly invisible against a black wall and a brass Turkish shoeshine stand gleams on the hearth. Featured elsewhere in this issue (page 62), the Gegg-designed kitchen is delineated by an 18-foot Caesarstone quartz-topped island, which has a custom niche showcasing Fancy Lady, a Time McClendon wire and crystal sculpture commissioned by the homeowners. 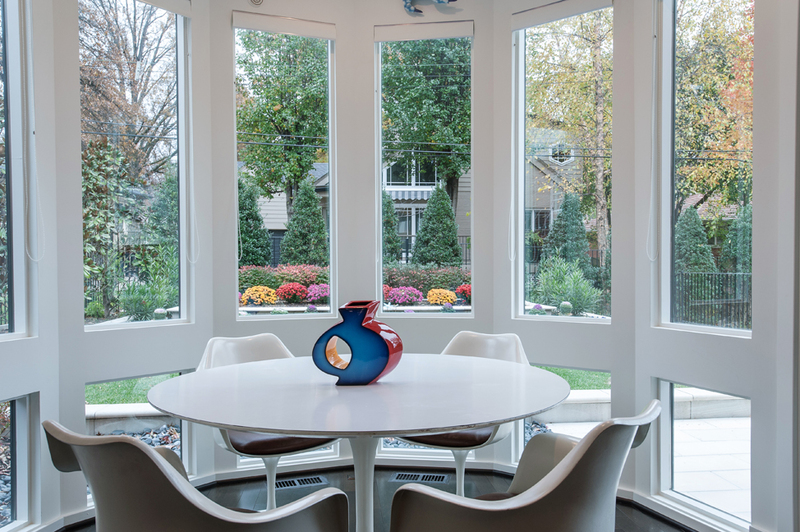 Informal meals are served in a sunny bay, an exact duplicate of the casual dining area in the owners’ previous home and furnished with an original Saarinen dining ensemble. The alcove’s full-height windows overlook a beautifully terraced yard, designed by landscape architect Matt Moynihan and filled with seasonal color by Baxter Gardens. The remaining half of the main level is devoted to the master retreat. 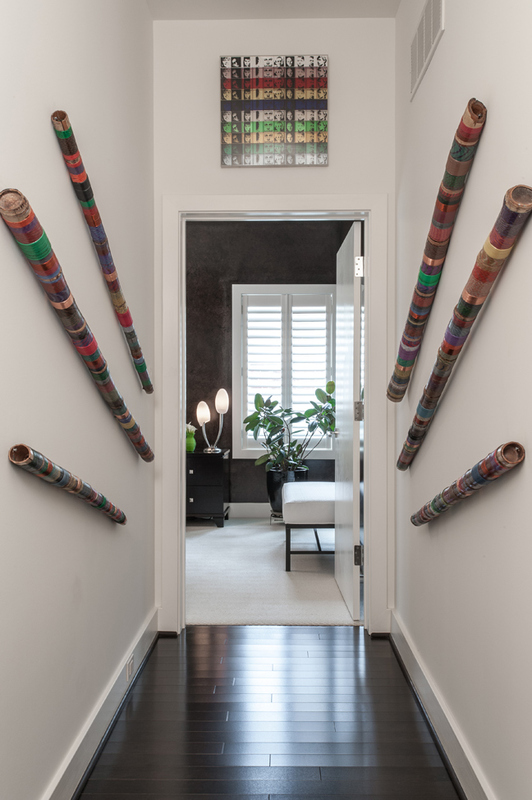 Cylindrical sculptures and an Andy Warhol montage line the walls of the hall leading to a powder room, papered with the husband’s collection of New Yorker covers; the owners’ sitting room/library and adjacent home office; and a tranquil, Zenlike master suite. 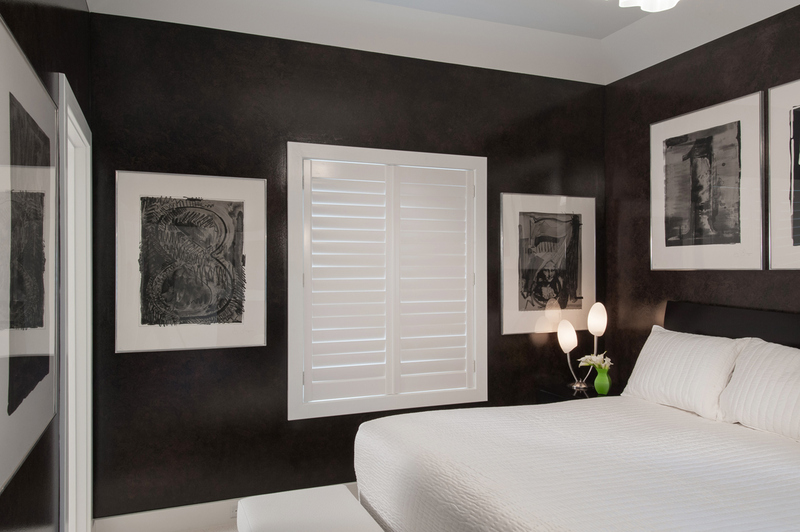 Coffered and sublimely furnished in black and white, the master bedroom’s black walls are quietly embellished with a 10-piece series by Jasper Johns, entitled Numbers. 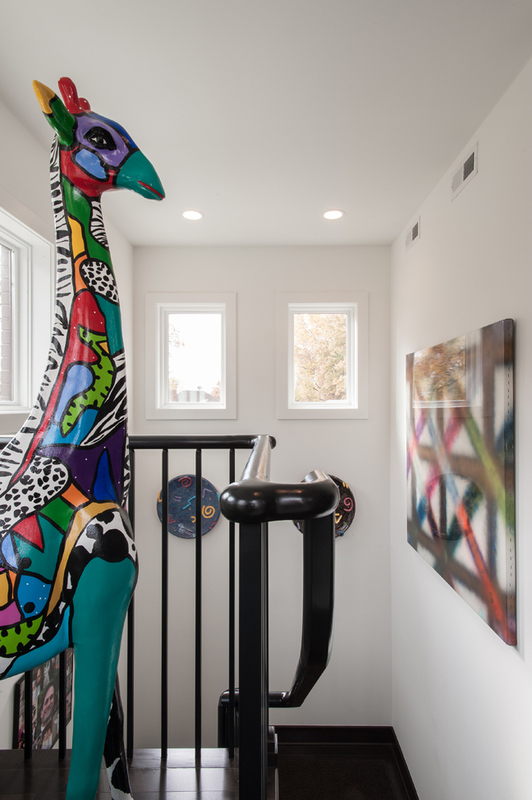 A colorful fiberglass giraffe by Marcie Ziv guards the lookout landing, and a warm red wall accents the guest sitting room, which easily converts to another bedroom. For durability, Salinas custom-designed the cabinetry in walnut-grained Formica to simulate the main floor’s rich natural woods. Furnished in soft blues and peach, the guest suite is similarly child-proof and makes use of every inch of space with cleverly hidden storage cabinets. Suitable for entertaining or additional guest accommodations, the lower level consists of a large main room, half bath, laundry room and an oversized “mud room” with generous storage space for luggage. Brilliantly designed, this “forever home” has thoroughly satisfied its owners’ objectives – abundant functional space, lavished with contemporary art, a lush yard – and a set of pet dishes, ready and waiting for their new rescue dog, Cookie.